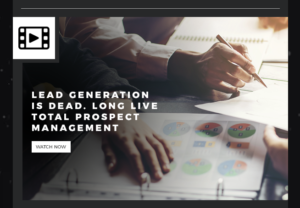 Lead Generation is dead. Long live Total Prospect Management. We have chosen this provocative title for our April newsletter in order to stress a theme that is at the heart of our life as a business: traditional Lead Generation practices will not deliver new business opportunities in the 21st century B2B sales scenario. The truth is that most markets are finite and existing businesses are likely to be either your clients or your competitors’ clients; if you base your business development strategy only on looking for new leads in your marketplace, you may miss the bigger picture. Besides, very often marketing and sales teams are not well aligned; as a consequence, a lead generated by the marketing team may not be of use to the sales teams, with resulting waste of time and energies. Of course this is not to say you should not be looking for new leads altogether: businesses always need leads, but a sound business development plan must be based on a wider approach. This is where Total Prospect Management (TPM) comes into play. TPM is our approach to New Business Development: it gives you a complete view of your prospect universe, allows you to identify the best sales opportunities early and to build a solid sales pipeline. On 27th and 28th March, we exhibited at the B2B Marketing and Sales Innovation Expo in ExCel, London and held a seminar called “Lead Generation is dead. Long live Total Prospect Management”. The Expo was a great chance to talk to businesses from across the world – including some of our existing clients; the conversations we had with them on our stand or during the seminar only reinforced our belief in our TPM approach. What we learned at the B2B Marketing and Sales Innovation 2019 Expo. A blog posts which contains the main issues discussed with business leaders during the two days: the questions, the challenges and the answers. Finally, our Business Development survey and checklist. The survey is a really good way to carry out a health check of your business development strategy; it will take 5 minutes to fill and will allow you to download our FREE Business Development Checklist. You can follow the link below to read our April Broad Sheet; we hope you will enjoy reading it as much as we enjoyed writing it.